Well, I'd like to apologize for the late post today, nothing like chipping a tooth! Anywho I got that taken care of and now it's time for something fun. Today's Friday Flashback is another rare sneaker that I never knew anything about until it had already come and gone. I am talking about the Chuck Taylor Dennis Rodman edition. In the late 90's Converse was pushing Rodman big time, he had his own line of shoes, chucks, shirts, shorts, and I am pretty sure accessories. 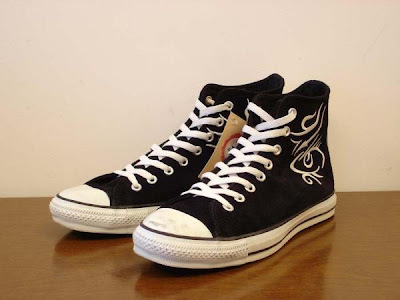 So D-Wade is not the first Converse athlete to have his own apparel line, actually he would be the third. Magic had his own line of sneakers and clothes as well. 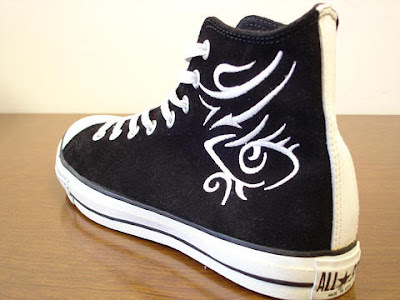 I digress, today is about these wonderful Rodman Chucks. I got these pictures from the Converse message board hosted by Converse China. As you will see the Chucks are black/white in colorway. They feature two of Rodman's more famous tattoos on both sides. And just like Chucks should be, they're made in the U.S.A. I am off to go do some semi-last minute Christmas shopping as I am sure most of you will be doing too. Be safe out there, it's a mad house, well I am only guessing. 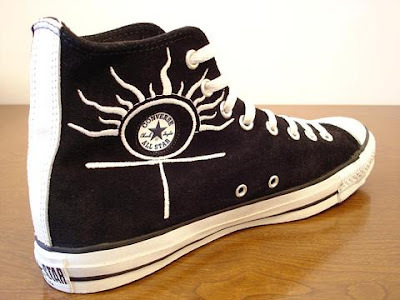 Anyway thanks for checking out the Converse Blog and please return often!